The architecture structure of St. Labre Indian Chapel was inspired by the teepee of the Plains Indians. The great wooden beam that runs through the ceiling skyward, rests in the 'smoke hole' opening. On either side of this great cross beam are beautiful stained glass windows. St. Labre Indian School made a humble beginning in 1884 with the construction of a log cabin school operated by four Ursuline Sisters. In 1883 a soldier, Private George Yoakam stationed at Fort Keogh near Miles City, recognized the hard times experienced by the Northern Cheyenne. He contacted Bishop Brondel and told him of the Indian people who were roaming the Tongue River Valley without homes or land. Land was subsequently purchased by the bishop and construction of a log cabin school began. This three-room cabin served as residence, school and dormitory, as well as the church. 29, 1884 St. Labre Indian school became a reality. A replica of the cabin now stands on the site of the original mission. Today St. Labre is responsible for the welfare and education of nearly 700 Indian children. 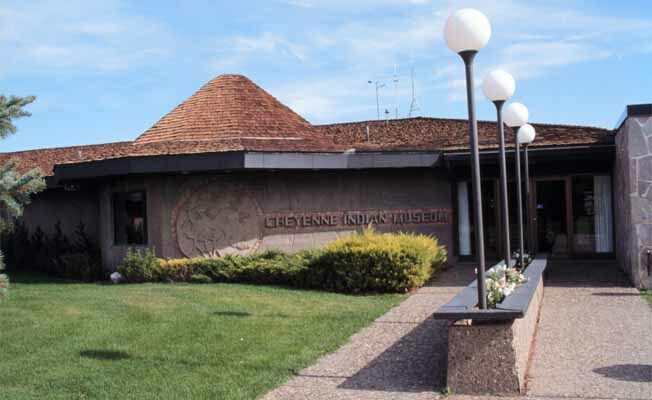 The Cheyenne Indian Museum features Plains Indian artifacts and a documentary film on the Saint Labre school. Visitors are welcome! Tours conducted 8:00am to 4:30pm. Extended Hours - Memorial Day through Labor Day. To find St. Labre Church, take Highway 212 to Ashland. At junction of Conoco Station and Western 8 Motel, turn north and go about 1/2 mile. Take first right after the bridge. It's at St. Labre Indian Mission. Look for the teepee shaped building which is the church.To find St. Labre Church, take Highway 212 to Ashland. At junction of Conoco Station and Western 8 Motel, turn north and go about 1/2 mile. Take first right after the bridge. It's at St. Labre Indian Mission. Look for the teepee shaped building which is the church.